What will it take to be successful as an entrepreneur or in business in 2018? Well, we don't all measure success in the same way. We define success in so many different ways that it's quite open to interpretation as to what "it" looks like. I think too many of us, little or small-time entrepreneurs, are extremely harsh in our judgement of how successful we've become. We dream about becoming the next Gary Vee, Daymond John, or Lori Greiner, and if we don't do it within the year, we get down on ourselves. For 2018 I want you to be happy with your success, no matter how little headway you make in your business. When you think about how far ahead of you people like the three I mentioned above are, you tend get discouraged AND to lose sight about why you became an entrepreneur: to be your own boss. That's it, right? Fundamentally, you want to simply be able to call your own shots, build something that belongs to you, and support yourself (your family, etc.) financially. If you make enough from your hustle to save for retirement, and do some investing on the side, then you did it! Congratulate yourself. Keep going, of course, but if you don't reach the status of a Grant Cardone, it's not the end of the world! I belong to a Facebook group called, Rise and Grind Ambassadors. We're all like-minded individuals, with drive, a slew of combined expertise, and of course, fans of the great entrepreneur and Shark Tank shark, Daymond John. 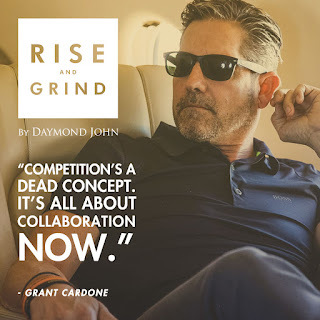 The name of the FB group is that of his upcoming book, which you can pre-order here: Rise and Grind: Outperform, Outwork, and Outhustle Your Way to a More Successful and Rewarding Life . 1. Join a Facebook group of like-minded individuals that have a knowledge of your industry or what you're trying to do. It's essentially the modern day "mastermind" concept proposed by the great Napoleon Hill, in Think and Grow Rich! : The Original Version, Restored and Revised (tm) . 2. Don't be late to join the party. If your competitors are onto something, quickly emulate to stay in lockstep. There is no shame in "borrowing" ideas or innovations. 3. Make as much of your business (or service) as possible mobile friendly. We are all smartphoneholics! 4. Find ways to save your core customer time or at minimum to make it more convenient for them to buy your products or service. 5. If you can convert your LLC or S-Corp into a C-corp...do it! You'll save the most in taxes so long as the Republican Tax plan stays law. 6. Be mindful of interest rates (your "current ratio") and of inflation of the materials you need to make your products. It's gonna be an interesting year for this! 7. People think branding is like a light switch that you can turn on and off. You have to eat, sleep, and dream your brand in order for people to take you seriously--Pee Jay. 8. Don't give up. Success stories don't happen overnight; they take years to happen--Joyce Cutshaw-Singer. 9. Perfection is the enemy of progress, and often too many entrepreneurs don't trust others and try to do everything themselves. This is harmful--Cory Warfield. 10. You are the one! You are in charge! Nobody is responsible for your success and failures but you. It's an inside job--Deeds Blount. 11. Remember your character, it's who you are--Joni Downey. 12. It's okay to try and fail, just don't fail to try--Buddy Aces Busser. I think we're all saying sort of the same thing here...be genuine and stay the course. You don't have to get everything right, but you do need to continuously learn. 2018 is going to be a year full of achievement for you, keeping in mind that achievements don't have to be monumental. Alright, thanks for reading and for believing! When your business revenues hit the multiple six-figure+ range, business owners are typically faced with a new challenge in their business - creating new growth. Most made a post owners hire an Online Business Manager when they've hit the ceiling, feel frustrated, are stuck, and simply cannot grow the business anymore by being the only one in charge of everything! They realize that they must step out of being the one that is "DOING" making space to fully step into a leadership role in order to grow to 7-figures and beyond.